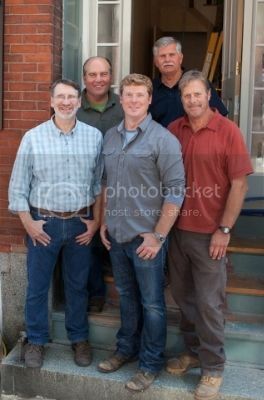 New Yankee Workshop and Norm Abram Fans! 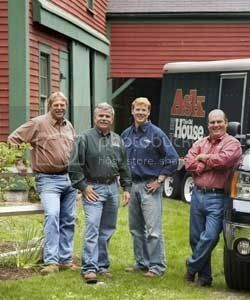 This Old House And Ask This Old House Are On Tonight "Updated"
This Old House And Ask This Old House Are On Tonight "Updated"
Master Carpenter Norm Abram visits the Hancock-Clarke house to see where Paul Revere stopped to warn John Hancock and Samuel Adams of the advancing British troops during the start of the American Revolution. Host Kevin O'Connor recaps how the roofers applied new architectural shingles to tie the old house in with the new addition.General Contractor Tom Silva shows Kevin the progress on the new back deck, and how the architect has called for a corner stair leading down to the backyard. The framing requires two sets of traditional stringer systems, joined in the middle by a hip stringer and a series of jack stringers; the same idea as framing a hip roof. Kevin finds Richard Trethewey and plumbing contractor Kevin Bilo fighting to keep the P-trap from the new bathtub on the second floor from interfering with the decorative ceiling of the new kitchen. They use a new German bath waste and overflow kit that allows for the flexibility needed to solve the problem. Kevin and Norm finish up the trim and decking on the new corner deck stair. For the ipe deckboards that are sharply mitered in the corner, Norm has settled on using a floating tenon connection to prevent them from opening up over time. In the barn, General Contractor Tom Silva and Host Kevin O'Connor build a watertight fire pit cover. Then Scott teaches Kevin about the evolution of fuses. Plumbing and Heating Expert Richard Trethewey heads to Missouri to upgrade and vent a bathroom sink. And the guys ask "What Is It?" In the barn, Tom and Kevin build a watertight fire pit cover. All of the tools used can be found at the local home center or carpentry supply store. The wood used for the fire pit cover was ipe decking?also known as Brazilian walnut, one of the densest hardwoods out there. Ipe can be found at the local decking supply distributor. Tom shows a red object with an L shape on one side, and an adjustable leg on the other. In the barn, Scott teaches Kevin about amperage and how the electrical fuse has evolved over time. All modern electrical wires, breaker box and fuses can be found at the local electrical supply house. 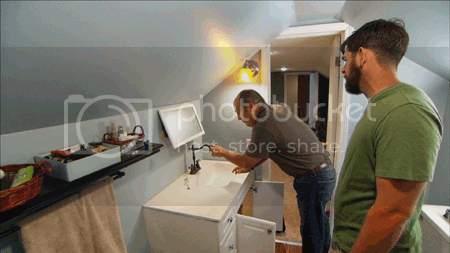 Richard heads to Missouri to upgrade and vent a bathroom sink. Richard installed the Vega Single Control Centerset Bathroom Faucet in Brushed Nickel, which is manufactured by Pfister Faucets. All other parts for this project, including PVC drain piping and an air admittance valve can be purchased from a home center or plumbing supply store. NewWookiee.com is neither affiliated with nor endorsed by The New Yankee Workshop. NewWookiee.com is copyright 2003-2019 by Philip Wise. All Rights Reserved.